A green iceberg sighted in the Weddell Sea, Antarctica on February 16th, 1985. Credit: AGU/Journal of Geophysical Research: Oceans/Kipfstuhl et al 1992. Researchers have proposed a new idea that may explain why some Antarctic icebergs are tinged emerald green rather than the normal blue, potentially solving a decades-long scientific mystery. Pure ice is blue because ice absorbs more red light than blue light. 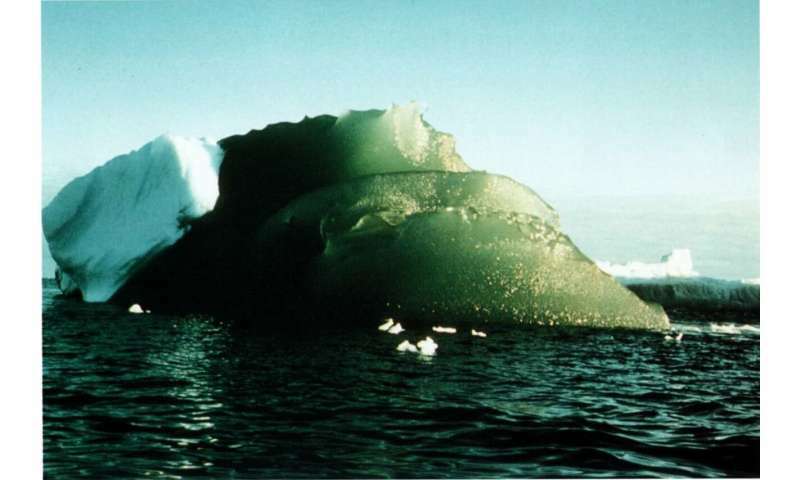 Most icebergs appear white or blue when floating in seawater, but since the early 1900s explorers and sailors have reported seeing peculiar green icebergs around certain parts of Antarctica. Iron is a key nutrient for phytoplankton, microscopic plants that form the base of the marine food web. But iron is scarce in many areas of the ocean. If experiments prove the new theory right, it would mean green icebergs are ferrying precious iron from Antarctica's mainland to the open sea when they break off, providing this key nutrient to the organisms that support nearly all marine life. "It's like taking a package to the post office. The iceberg can deliver this iron out into the ocean far away, and then melt and deliver it to the phytoplankton that can use it as a nutrient," said Stephen Warren, a glaciologist at the University of Washington and lead author of the new study in the Journal of Geophysical Research: Oceans, a journal of the American Geophysical Union. "We always thought green icebergs were just an exotic curiosity, but now we think they may actually be important." Warren started studying the phenomenon on an Australian expedition in 1988, when he took a core sample from a green iceberg near the Amery Ice Shelf on the coast of East Antarctica. Interestingly, the green ice he saw was a deep emerald hue much darker and clearer than that of normal icebergs—a signal to scientists that green ice might be different from regular iceberg ice. "When we climbed up on that iceberg, the most amazing thing was actually not the color but rather the clarity," Warren said. "This ice had no bubbles. It was obvious that it was not ordinary glacier ice." Icebergs break off of glaciers and ice shelves that jut out into the sea. Typical glacier ice forms when layers of snow build up and solidify over time, so it naturally has air pockets that reflect light. But in Antarctica, some icebergs have a layer of what's called marine ice: ocean water frozen to the underside of an overhanging ice shelf. Marine ice is clearer and darker than glacier ice because it doesn't have any air pockets to reflect light. When Warren and his colleagues analyzed that iceberg and other green icebergs sampled by Australian expeditions in the 1980s, they found the green parts were made of marine ice and not glacier ice. They suspected an impurity in the ocean water underneath the Amery Ice Shelf was turning some marine ice green. Their first thought was that dissolved organic carbon, microscopic particles of long-dead marine plants and animals, was getting trapped in the ice as the water froze to the underside of the ice shelf. Dissolved organic carbon is yellow, so if pure ice is blue, the addition of yellow particles could turn the ice green, according to Warren. But when Warren and his colleagues sampled icebergs on a subsequent expedition in 1996, they found green marine ice had the same amount of organic material as blue marine ice, so something else had to be responsible for the green color. The problem nagged at Warren until a few years ago, when an oceanographer at the University of Tasmania tested an ice core from the Amery Ice Shelf for its iron content. She found marine ice near the bottom of the core had nearly 500 times more iron than the glacial ice above. Iron oxides found in soil, rocks, and common rust tend to have warm, earthy hues—yellows, oranges, reds and browns. So Warren began to suspect iron oxides in the marine ice could turning blue ice green. But where was the iron coming from? As glaciers flow over bedrock, they grind rocks to a fine powder known as glacial flour. When the ice meets the sea, this glacial flour flows into the ocean. If the rock dust becomes trapped under an ice shelf, the particles could be incorporated in marine ice as it forms. Warren now suspects iron oxides in glacial flour from rocks on Antarctica's mainland are responsible for creating the stunning emerald icebergs. He and the Australian iron researchers now propose to sample icebergs of different colors for their iron content and light-reflecting properties. If their theory proves correct, green icebergs could be more important than scientists thought.